Owning property in Saratoga Springs can unfortunately open up the possibility of water damage emergencies from natural sources. Cold temperatures can lead to frozen or burst pipes, which can lead to water overflow property. These kinds of water emergencies can be overwhelming to handle if never experienced before. That’s why it’s important to call the professionals at 911 Restoration of Saratoga Springs. The trained technicians are able to get the property clean and dry in record time. They are IICRC certified, so there is nothing they can’t handle. No water remediation task is too much for them to handle. In addition, the specialists work with all insurance companies and will work with you to make sure that your needs are covered by your plan. The technicians work diligently to restore the property after any water remediation. They take the time to ensure that your property is in the best condition possible. When you need assistance for a flood cleanup, call 911 Restoration of Saratoga Springs today. Water damage emergencies in the Clifton Park area can originate from a variety of different sources. The freezing temperatures can lead to frozen pipes, which can easily burst and flood onto the property. The excess water can lead to further damage on the property if the flood cleanup is not handled in a timely manner. That’s where 911 Restoration of Saratoga Springs comes in. Calling our technicians means not only will you receive the best care possible, you will receive it as quickly as possible. That’s because our technicians have a guarantee of a response time of 45 minutes, and are available around the clock. The technicians truly care about all of your water remediation needs, and understand that time is of the essence. That’s why they take care of any flood cleanup right away. They also will ensure that all of your belongings that are not damaged are boxed and put away so they will be kept safe and dry. The technicians can handle any sewage backup cleanup, basement flooding and more. Any water remediation task is within their skills, and will be handled with the utmost professionalism. All leak detection and repairs will be carried out by the water extraction staff. Not only do the Ballston Spa techs respond to all calls swiftly, they take extra care to ensure all emotional needs are taken care of. Both you and your property will be given the patented Fresh Start attitude and treated with optimism. Call 911 Restoration of Saratoga Springs for the best possible water remediation today. It’s important not to neglect mold inspections after flooding emergencies on the property. The musty smell left behind can be unmistakable, and should be left to a professional to deal with. Fungus can quickly grow and multiply, so it’s imperative to catch it in a timely manner. These unsightly spores can not only damage the property, they can be harmful to your health as well. Some symptoms from mold deteriorating the property include asthma, allergies and headaches. This can also lead to discoloration of the walls and further destruction of the property beyond your control. If you see mold on the walls or in the basement after a flood, the next step should be to call our team of trained technicians to take care of it immediately. 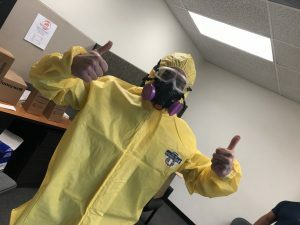 The mold removal techs in Clifton Park handle all kinds of remediation with care. They also can conduct third-party mold testing to truly get to the root of the issue. In addition, the specialists use dehumidifying and drying equipment to maintain the structural integrity. It’s never a good idea to try to handle any mold removal after burst pipes on your own. The specialists are trained to take care of this, and they have the proper equipment and hazmat suits to tackle it. Infrared cameras are also used to spot any neglected areas that could be otherwise missed. The professionals understand your needs after any water damage emergency. 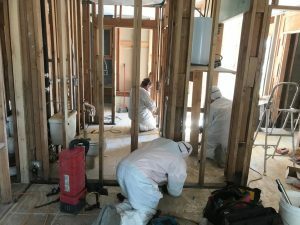 They recognize that water remediation after a flood is a difficult time, and want to minimize that as much as possible. The specialists take extra care to ensure that your needs are taken care of. You will be in the best hands possible for any water extraction. Don’t hesitate and call the specialists at 911 Restoration of Saratoga Springs today. Ballston, Ballston Spa, Clifton Park, Corinth, Galway, Greenfield, Hadley, Malta, Mechanicville, Milton, Round Lake, Saratoga Springs, Schenectady and surrounding areas, Schuylerville ,South Glens Falls, Victoria, Waterford, and Wilton.